“Walter Veach of this city, is the proud owner of a football which has been autographed with the names of ‘Red’ Grange and other members of the Chicago Bears professional football team. The ball was used in the New Year’s day game at Jacksonville, Fla., when the Bears and Ernie Never’s All-Stars played. You could say that Walter Jr.’s papa was a rolling stone. Indiana native William Walter Veach Sr. played baseball for two major and many minor league and club teams in 11 states and 2 foreign countries from 1884 until 1897. He acquired the lyrical sobriquet “Peek-a-Boo” while pitching for the Kansas City Cowboys in 1884. Walter Jr., sometimes referred to by Indiana sportswriters as “Young Peekaboo,” spent most of his youth in Indianapolis. After only one year of high school he thought to follow in his dad’s footsteps as both a professional baseball player and a steamfitter. However, by the time he was 17, he was serving in the U.S. Navy as a 2nd Class Fireman in the Engineer Corps. After his stint in the navy he went from local club teams to minor league teams when he wasn’t fixing pipes. Just as he was to become a catcher with the Minneapolis Millers of the American Association in the spring of 1917 he went into the U.S. Army. After 16 more months of military service Walter Jr. was back in Indianapolis catching for the Nordyke-Marmon industrial league team. Nordyke was a well-known company that built mills in the Midwest. Perhaps this is what brought Veach to Decatur, for by September 19, 1919 he was playing catcher for the Staley industrial league baseball team and a few days later took a position in the plant. On September 25 of that year he was one of 30 men who came to the first day of practice for Staley’s new football club. With little-known formal gridiron experience on his resume, Veach [always misspelled as “Veech”] became the starting left half back on a squad that had future Staley pro players Jack Mintun, Red May, Jake Lanum and Charlie Dressen. In the spring of 1920 Veach continued to work at the Staley plant and played on the improved baseball team with George Halas as captain. On May 26, 1920 Walter married Decaturite Alma Elizabeth Shields. Three weeks later Veach and two other newly-wedded ball players received silver pitchers as each came to bat, gifts from the Staley employees. 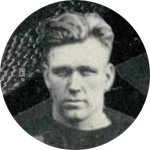 In July though Walter threatened to turn in his uniform because manager McGinnity wasn’t giving him enough time behind the plate, but he ended up finishing out the season and then playing football for the Decatur Staleys that fall. In 1921 Veach moved on to be the manager of the Springfield Sangamo-Electric baseball team and later moved to Monroe, Louisiana. In Monroe he played baseball in the Cotton States League until 1925 before becoming a part-time umpire. Over the next 40 years he worked at various times as a sanitary inspector for the city; as a maintenance man in the city water department; for the U.S. government at Oak Ridge, TN during World War II; as assistant Civil Defense director for the city, and finally as president of the local plumbers and steamfitters union. He was a singer, very active in the Masons and a long-time member of the American Legion. He passed away when he was 83 and was buried in the Mulhearn Memorial Park Cemetery in Monroe. Copyright ©2015 Mark W. Sorensen.